An aquarium in the home has many benefits for all of the family; be it a source of entertainment and decoration for your household with proven therapeutic benefits. Designing your own dream aquarium, with so many options out there on the market, is down to preference. However other factors need to be considered when decorating your aquarium. For example providing hiding places and spawning sites for the aquariums inhabitants can be achieved through the addition of aquatic rocks and plants to provide a homely setting for its inhabitants alongside acts as a fantastic addition to your aquarium. When including rocks please bear in mind that not all rocks are suitable for just any aquarium. Whereas some rocks will be suitable for freshwater aquariums that doesn't mean they are ideal for saltwater aquariums. This also applies to petrified wood which is ideal for softwater, acidic fish but not so much for hardwater, alkaline fish. These additions can also effect the pH levels of your aquarium, and some rocks with traces of 'heavy metals' can adverse the effects of your aquarium. Furthermore in the marine aquarium live rock has become very popular providing significant benefits such as stabilising the water chemistry of an aquarium, acting as a biological filtration hosting large quantities of nitrifying and denitrifying bacteria which maintains better water quality alongside providing your aquarium with a more natural look. Lastly ornaments are water displacement items. The more ornaments that are in the aquarium, the less water volume. Therefore it is imperative to closely monitor water parameters. 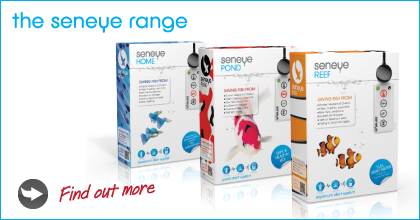 The Seneye device assists with this to provide peace of mind.